After much deliberation, I have decided to continue the 50 Movies Project. These projects are very much what this site is all about, and I hate to break tradition. This year, I am switching things up a bit. 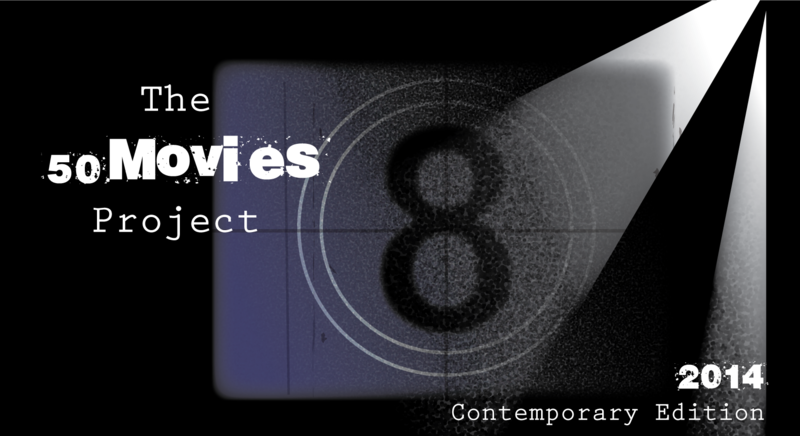 The focus will be on contemporary films, meaning anything from 1980 to present day. It was surprisingly easy to put together a list of modern films that I missed — my first draft had nearly 170 titles! It took a while to whittle this down to 50, but I’m pleased with the end result. I tried to make a mix of popular and critically-acclaimed movies this time around, so there’s everything from Top Gun to Amour. I would love to hear your thoughts on these. Any particular titles you would recommend watching first? It’s pretty hard to dislike The Iron Giant. I’m glad you’re continuing on with the project and it’s an interesting list! Lots on there I’ve never seen so I’ll be glad to see what you think of those. How did you come up with the 170 movies? This is inspiring me to create such a list, maybe I’ll watch with you! There are quite a few in there I have really liked including Amour, Catch Me If You Can, Thelma and Louise, Dirty Dancing (of course! ), Fast Times. Are you keen to start on a high or get some out of the way that you’re not really looking forward to? Very interesting mixture of genres and styles. Some top movies in the list, some of which I’ve seen others I want to. Thanks! I tried to keep it pretty diverse. Can’t wait to dig in! Thanks! Not sure how I made it through life without ever seeing a Rambo movie. Looking forward to that. Hopefully the post-1999 picks don’t disappoint! Very good and diverse list. I highly recommend Incendies, it’s a stunning drama with a fantastic lead and a powerful story. 4 Months, 3 Weeks and 2 Days from Cristian Mungiu from Romania, where I’m from, it’s another powerful drama. I had lots of fun with Misery and Out of Sight. Good Night and Good Luck is a film I loved a lot, very different film but I was so pleased with it. SIdeways, The Aviator and The Orphanage are great too. Thanks! Looking forward to seeing all of those you mentioned, especially 4 Months, 3 Weeks and 2 Days, which I have heard nothing but great things about. Hey, thanks Ruth! Yeah, some of those 80s flicks have to be a bit shocking. 😀 Oddly enough, I have actually seen the Dirty Dancing musical but never the film. Should be a fun trip through the 80s and beyond! Good to know! That will probably be one of my first entries since it’s on Netflix, too. Definitely FAST TIMES AT RIDGEMONT HIGH! Excellent coming of age film. And no matter how many times I see it, Sean Penn’s performance never ceases to make me giggle! 🙂 Secondly, I’m torn between Sideways and When Harry Met Sally! When Harry Met Sally is the best romantic comedy ever written, but Sideways is an incredible film that could be my life if I weren’t happily married. Enjoy whichever films you end up choosing first. I hated Being John Malkovich, so I’ll be interested in your take on it since it’s a favorite among actors and other Hollyweird folk. Ahhh, yeah I’m going to have to get to those early on! I’m not much of a rom-com guy, but I can appreciate them when they’re smartly written. As for Being John Malkovich, based on how weird it sounds, I have a feeling I’ll either love it or hate it. Hopefully the former! Glad you are continuing the list, some great films on there. Some of my top choices would be Stand By Men, The Untouchables, Misery, Apollo 13, and Thelma & Louise is one of my all time fave films, I thin that’s brilliant. I also saw Dances with Wolves recently for the first time, that was really good as well. Will look forward to this new project! Awesome, glad to hear you’re a fan of so many of these! Misery seems to be a popular choice — really looking forward to that one especially. Its a great film, Misery is one of my fave King novels as well. Enjoy watching the film! Haven’t seen that, but I can hazard a guess. Tarantino alleges that the “bromance” (and I hate that word, but it’s the clearest term for this) leans heavily into homoeroticism, right? …I can see the argument, in truth, just a little bit. But I do think it’s mostly a case of people repeating it over and over again until it sounds true. sign me up…I am down. WoW! You have never seen Catch Me if You Can? How did that happen? There are quite a few good ones on this list. Incendies and Amour are my respective favourites of those years. 4 Months… was my favourite first watch of last year(You know that). I also love Good NIght, and Good Luck. I hope you’ll have a great time watching these Eric! All the Best! Thanks! Yeah, no clue how I missed out on Catch Me If You Can. So many of these have just slipped through the cracks over the years. It’s crazy — I could easily do another 50 on top of these. Nice list. I think I might have seen at least half. I would highly recommend The King of Comedy, Amour, and Being John Malkovich, those are my favorites of the movies you’ve mentioned. Thanks! I can’t wait to see all three of those. It’s interesting. I’ve also decided to focus more on recent films this year, and am even going more towards post-2000 films. There are exceptions, though. You have a lot of great titles on your list. I’ve seen 39 of them, and several are among my favorites. I’m really excited to see what you think of Good Night, and Good Luck and Gomorrah in particular. Great stuff. Cool, I’ll have to keep an eye out for your post-2000 write-ups. I remember your glowing review of Gomorrah (from last year? ), and that was one of the biggest reasons I included it. Can’t wait to finally see it. Oh wow… This is a good list, although there will undoubtedly be some you won’t like. Wait… you haven’t seen Major League? You have good times coming, sir. Also, I like the site redesign. No clue when it happened (my apologies for not visiting more frequently), but the simple Apple sans serif, gray palette is cool in my book. Thanks! I changed the design on Sunday, so it wasn’t very long ago. I was just getting tired of the same banner and overall look so I went with something a bit more simplistic. As for Major League, yeah, I have no excuses. I’ve seen clips of it over the years but never the full movie. Pretty shameful considering how much I love baseball. Good list of contemporary films, Eric! Wait one… Godfather III?… Godfather, Godfather II, ceratinly… Part III? Surprised to see ‘Do The Right Thing’ and ‘Malcolm X’ not on the list. Haha, I had a feeling The Godfather III would raise some eyebrows. I included it just so I can finally finish the trilogy. Otherwise I probably wouldn’t have ever gotten around to it (though some might argue that’s not a *bad* thing). Do the Right Thing was one of my favorite films from last year’s project. I had it pegged at #2 in my overall rankings. Such a fantastic film. Malcolm X was a huge oversight on my part. That’s one I am going to make it a point to see even though it’s not on my list. Another ambitious yearly project! I’ve seen about 40 of them. Look forward to reading your reviews! Those 2 Alexander Payne films are probably my favorites of those 50. I just saw Road House(had never seen it either), and while it is flawed, I found it quite entertaining, in a so-bad-its-good kind of way. Excellent list. The King of Comedy is truly one of Scorcese’s unsung masterpieces. After Hours too, if you haven’t seen it. Once getting through those, I highly recommend John Landis’ Into The Night. If ever there was the stuff of one of those three movie marathons, you’ve got it there! Thanks! I nearly added After Hours — now I wish I would have. Thanks for the tip on Into the Night, too. So many good ones on this list! I’m a sucker for Fast Times, haha! I just watched Fast Times a couple nights ago. Loved it!